Calling all fans of Janet Evanovich and her Stephanie Plum series! How would you like to win a prize pack from the upcoming film One for the Money? The film is the first time we’ve seen Plum in action on screen and to celebrate, Movie Fanatic is giving away two prize packs that Evanovich’s fans will drool over. Katherine Heigl stars as Stephanie Plum (check out our interview with Heigl), a woman who is down on her luck and desperate to find a job. With nowhere else to turn, she takes a job as a bounty hunter for her cousin’s bail bonds business. And… her adventure begins. Enter below by telling us your favorite Heigl moment, whether it's on screen, TV or even her early modeling days, in the comment section below. 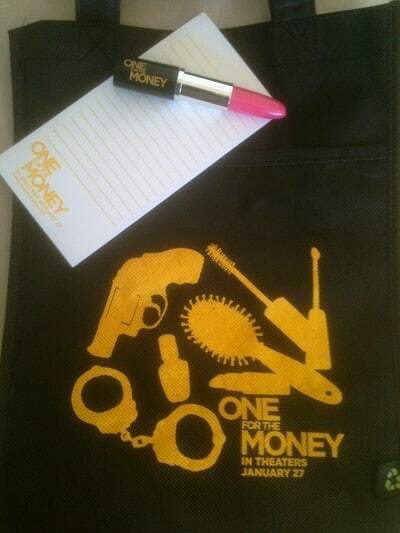 We will select two winners to each receive a One for the Money tote bag, lipstick pen and notepad set.